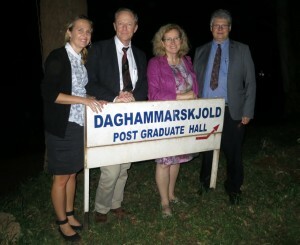 Peter Sundin, Stefan Swartling Peterson and Ulrika Ouline from Uppsala are with me (Eva) in Uganda, where we have had a busy and interesting day in Kampala. A few hours after arriving yesterday we attended a reception organized by the Swedish Embassy, on the occasion of Göran Hägglund’s visit with the Swedish Health Care delegation. Stefan Swartling Peterson gave a lecture earlier in the day on the non-communicable disease epidemic and health systems. Today we visited Makerere University in Kampala. Vice-Chancellor Ddumpa Ssentamu came to Uppsala in December 2012, and now we could return the visit. 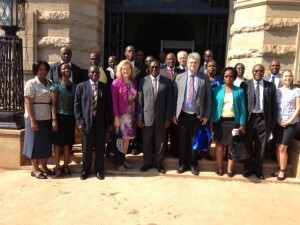 A delegation from the College of Health Sciences at Makerere University also visited us in September this year. The purpose of our meeting was to explore opportunities for more and deeper partnerships, and to support ongoing collaborations with a memorandum of understanding and exchange agreements. Stefan Swartling Peterson has several exciting collaborations with, and has also worked at, Makerere University. Uppsala University’s International Science Programme (ISP) has been active here for many years and I am impressed by their amazing work. A large assembly of the Vice Chancellor, members of management and College Principals met us and many interesting opportunities for cooperation were identified. We talked about already existing contacts and cooperation with Uppsala University, and it was striking to hear how many people that have an education from Sweden and other Nordic countries. In the afternoon we visited, among other things, the Department of Chemistry. A seminar with a short presentation of the research had been arranged for us, with a subsequent visit to the chemistry lab. The day ended with an Uppsala University reception, with invited guests and alumni. It’s been a day full of impressions and ideas, and I am impressed with the work that has been done. Tomorrow we visit ANoCC, the African/Asian Network of Caregivers, and then we’re off to the airport for the next stop – Malawi and the SANORD -conference.